Last week Pamela and I went to Crow-Hassan Park Reserve, near the City of St. Michael. Odonate activity was minimal -- a few Eastern Forktail damselflies and a patrolling Green Darner or two -- but the lakeside was covered with Eastern Tailed-Blue butterflies sucking up nutrients from the mud. Most of them were too wary to let me get close, but this one was very intent on licking its pebble. I took this picture on June 1st, near the confluence of the Sunrise and St. Croix rivers. Eastern Wood-Pewees were giving their pitiful call of "Hey guys!... Wait up!" and now and then a Redstart would chatter back "don't be so slow," but with the trees mostly leafed out, I didn't get a particularly good look at either. This female Dark Fishing Spider was much more cooperative and sat posing on a fallen tree trunk for at least ten minutes while I waited for the clouds to let through just enough sunlight. I know she was female because she was huge; males are only about half the size. 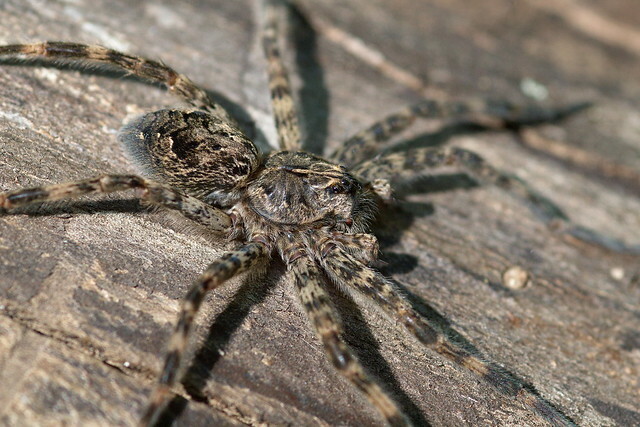 Spiders of the North Woods calmly explains that females of this species can look big with their legs spread out, but "in actuality, the largest span is only three and a half inches." I reject the premise that a three-and-a-half-inch spider is not huge. I have a new toy: an Olympus E-30 camera. This is the first SLR of any kind I've ever owned; all the photos I've posted up to now were taken with fixed-lens digicams, mostly the Nikon 8700. 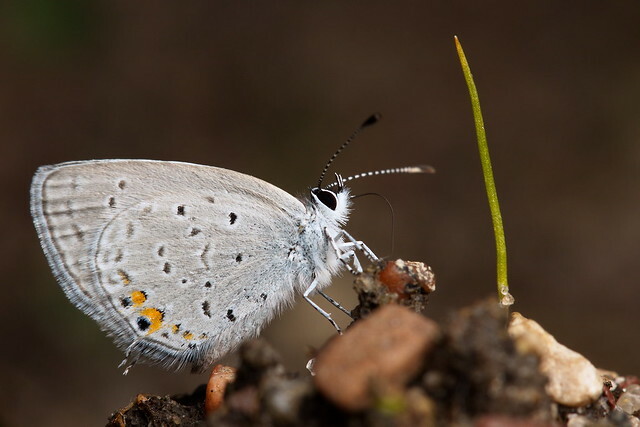 These cameras actually have some advantages for insect photography because their tiny sensors give more depth of field at a given aperture, but I've become increasingly dissatified with their limitations. For one thing, I wanted to photograph birds, and the 8700's lens just wasn't long enough. 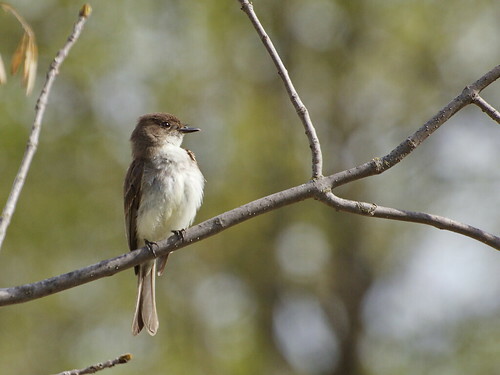 This is an Eastern Phoebe, perching next to the path at Elm Creek Park Reserve. I like how resolute it looks -- as if it's about to fly off and conquer something. Actually, its chest is all puffed out because it's just been grooming. 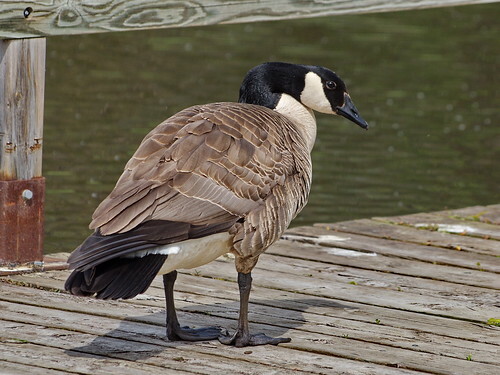 It's not clear that the world needs more pictures of Canada Geese, but I like the orca markings on their necks and the subtle browns on their wings. I like their insouciant attitude toward humans, too. Pamela and I once got stuck for quite a while behind a goose that kept walking slowly ahead of us on a narrow, overgrown path, refusing to speed up or fly away; clearly, we weren't worth the trouble of fleeing. This one looks a little wary of me, but what you're seeing is just a momentary pause in a long preening session.